Rural King Weekly Ad Circular Sale, valid April 14 – April 27, 2019. 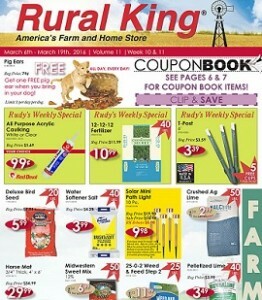 This Week Rural King Flyer sale best deals and prices: Midwestern Sweet Mix; Complete Horse Feed; Layer Crumbles; Safe Choice Senior; Cracked Corn; Whole Corn; Feather Fixer Poultry Feed; Floating Cat Fish Food; Rabbit Pellets; Rubbermaid 100 Gallon Stock Tank; Hen House; Bronco Fly Spray; All Showmaster S Series Feed; Wood Shavings; Mealworm Chicken Treats; Alfalfa Pellets; Era Liquid Detergent; Backpack Sprayer; Work & Western Boots For the Family; Essential Plaid Open Collar Short-Sleeve Shirt; Men’s 505 Jeans By Levi’s; Straw Hats For The Family; Mens & Ladies’ Clogs; Butter or Honey Wheat Pretzels; Bungee Cord Set; Pool Fast Set; Adult Sleeping Bag; Good Friends Hi Protein; Cuddler Dog Bed; and more. Find all deals and offers in the latest Rural King Weekly Sale Ad Flyer.